In the 1970s my parents were serious about backpacking, so serious that despite having four kids under ten, they were still ready to take on South East Asia. I was two, my brother six months old. This was before easy access to disposable nappies. Think about it. In the photos my mother stares calmly at the camera, long hippie hair, a cranky baby on each hip, the slums of Malaysia at her back, but she is smiling. At six and eight my brother and I were considered big enough to carry our own backpacks. Japan was the next destination. My father had taken the two older girls the year before, and now it was our turn. Mum’s campaign against passive smoking had finally won out, and Dad spent half the plane trip puffing unhappily on his cigarette down the back of the plane. The plan on arrival was to get straight out of Tokyo, and into the mountains. 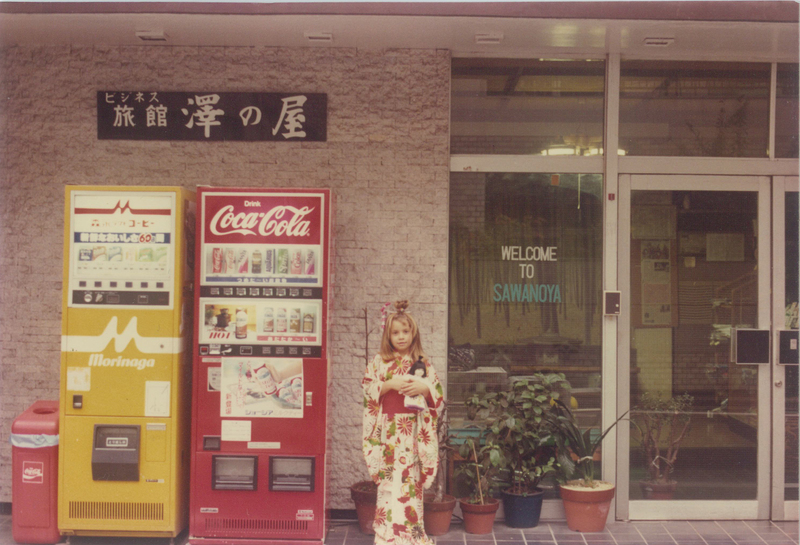 My parents were on the hunt for traditional Japanese Inns. 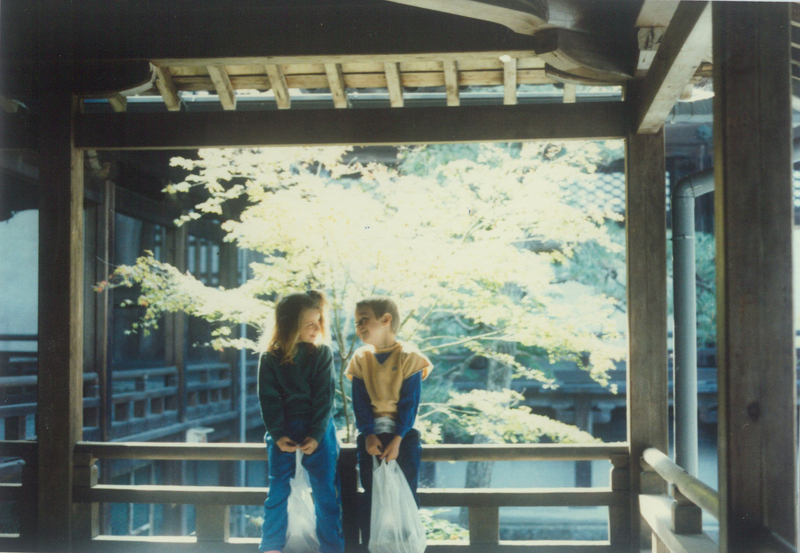 My father’s first priority was to wake up in Arashyama, a sleepy scenic town with a multitude of temples on the outskirts of Kyoto. Spurred on by his romantic sensibilities, we began the six-hour train and bus trip across country. Theoretically my brother and I could carry our packs, but once we entered the crowded subway the weight on our backs made us topple down the steep stairs at an alarming speed. “Grab them, they’re going to go over,” my mother screeched, frantically grasping for the loops on our packs. We were out of control, bouncing down the stairs in leaps and bounds. At the bottom our knees gave way, and my brother and I crumpled down together on the concrete. We sat wide-eyed and waiting for rescue, our oversized bags pinning us to the ground. From then on negotiating the subway became a team effort. Like puppies on leashes, my parents grabbed our bags at the top of the stairs. “Got them? Holding tight?” They’d double check, and then we’d all bounce down together. When we finally reached the Inn in Arashyama, exhausted and hungry, we were ushered through the immaculate Japanese garden by an elderly couple not much bigger than eight year old me. In the doorway began a bewildering array of bows. My brother and I did our best to keep up. Kids were clearly rare on the traditional inn circuit; the couple were excited to see us. They had soft creased faces and big smiles, but no English. Our room was simple. Tatami matting on the floor, rice paper doors, futons in the cupboards rolled out later for sleeping. The old woman signalled that we should kneel on the floor, and her husband brought in a small table, and a gas cooker. We watched as the woman carefully prepared our dinner, talking softly to us in Japanese. My brother, big-eyed and still slightly babyish, was the main attraction. While she cooked the old woman reached out a hand to softly pinch his cheek and touch his shiny blonde hair. He stayed still and quiet, as though hoping to camouflage himself against the tatami. When dinner was ready the woman broke an egg over the meat and stirred it about with her chopsticks. Sukiyaki. Motioning to my brother to open his mouth, she popped a slimy morsel between his lips like he was a baby bird. For the next hour, my brother did not refuse to open his mouth once. My parents and I were given our own small bowls, but the old woman continued to feed my brother with her chopsticks, patting his head and shyly laughing behind her hand. When all the food was gone she and her husband packed up the gas cooker and table, and backed out of the rice paper doors, bowing as they went. We all turned to look at my brother, my parents visibly proud of his magnificent effort to do as the Romans do. It was a moment to savour. He was a six-year-old traveller partaking of the exotic flavours of the big wide world, saying yes to every new experience that came his way. A true adventurer. I saw the admiration in my parent’s faces, and just for that second I wished it was me. I wished I’d been the baby bird. My brother looked back at us one by one, solemn-faced and wise-seeming, and then without warning he vomited all over the tatami.